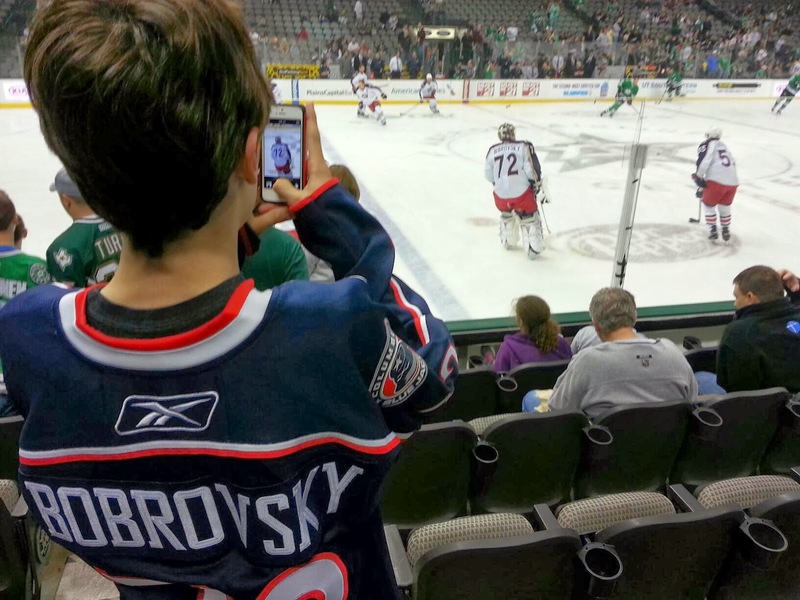 Spring break started today, so Eli 12.7 and Gloria decided to go to Dallas and see the Star play Columbus, because Sergie Bobrovsky is Eli's favorite goalie. I didn't go. I'm basically exhausted from traveling five of the last six weeks, plus one more big one coming up. So I stayed home to try and finish the new kickoff functionality in GS. They announced about 3:30 that Bobrovsky wasn't playing tonight, which was a huge bummer. Plus, Dallas was playing their backup as well, because Kari Lehtonen was hurt in a collision Saturday night. That has to be one of my favorite pictures of Eli. Then the game started and Rich Peverley almost died. Peverley had missed time with an irregular heartbeat and just returned to the lineup a few days ago. Early in the first period, Stars players started smashing their sticks on the ice and jumping off the bench while the puck was live. Peverley had collapsed on the bench, and it was a terrifying moment. Medical personnel ran to the dressing room, carrying him in their arms. It's one of the scariest things I've ever seen on television. I can't imagine what it was like to actually be there. They updated a few minutes ago that it looks like Peverley will be okay. I don't think he would have made it without the immediate attention he received.